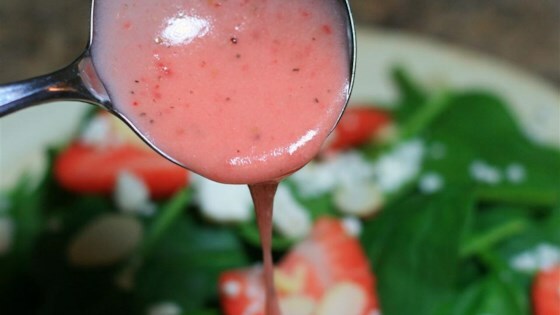 "This strawberry vinaigrette changed the way I eat salads. It's easy, delicious, and low-calorie. I like it with a spinach, almond, and feta salad." Blend strawberries, honey, apple cider vinegar, olive oil, salt, and black pepper together in a blender until smooth. I made it with fresh strawberries and it was amazing. I agree it's a little thick but all the flavor is there. So quick and easy. I made it without Salt or Pepper, and I used fresh strawberries and it still taste great. This has changed the way I view store bought salad dressing, NO MAS!!! I used fresh strawberries! If you just taste it, then you might think it's too sweet. I put it on a spinach salad with feta and chicken. We loved it!! Healthy too!